The Waterfront Plan was adopted in 1997. The Plan includes the Waterfront Design & Access Element which sets urban design goals and policies for Port revitalization projects. 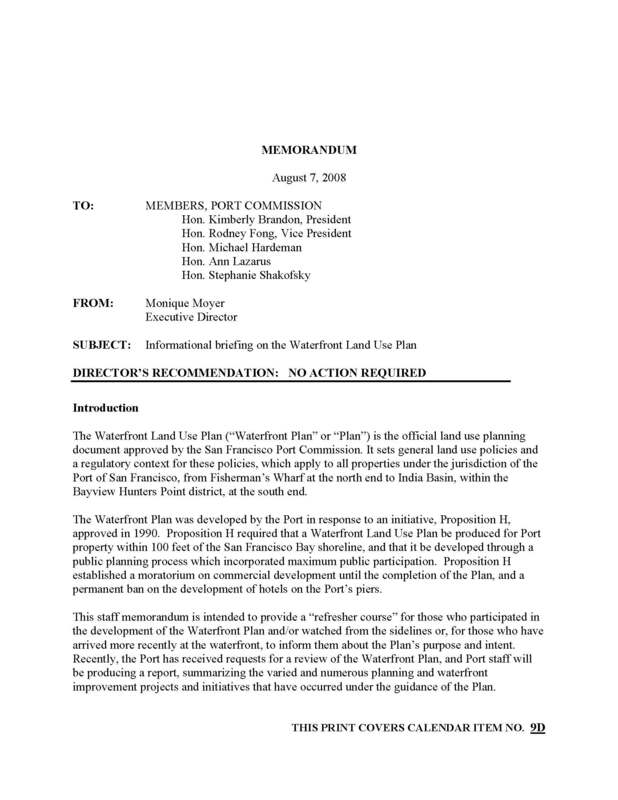 The Waterfront Plan has been amended periodically; current policies are presented in the 2004 republished edition. Links to a Summary of the Waterfront Plan, as well as the full content of the Plan (by chapter) are provided below. In 2015, the Port completed a comprehensive review of land use changes and events that have occurred under the Waterfront Plan. A link to the full content of this 2015 Waterfront Plan Review Report (by chapter) also is provided below. In concert with the Waterfront Land Use Plan, the Waterfront Design and Access Element sets forth policies to direct the location and types of public access and open spaces, public view corridors, and historic resources, and also provides site-specific design criteria for San Francisco's waterfront. This report chronicles the changes and events along the San Francisco waterfront from 1997 to 2014, guided by the Waterfront Land Use Plan.